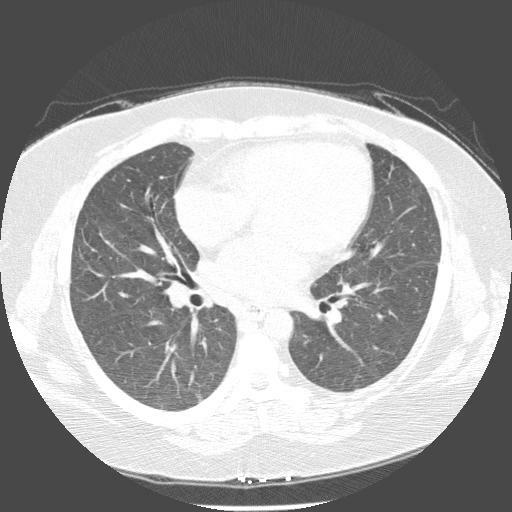 In November of 2004 a follow-up CT showed that there was still a residual opacity in the lung abutting the pleura. He was no longer symptomatic. A bronch was done; airway exam was unremarkable. Micro and cyto were negative. A repeat CT 3 months later showed persistent opacity in the RLL; there was the nodular opacity in the right lower lobe measuring 2.1 cm x 2.1 cm. There was no significant change in the size, but surrounding areas suggested some resolution making an inflammatory process possible. This month he developed a bit of hemoptysis and was hospitalized briefly. A repeat CT done this month showed size now 3.4 cm x 2.1 cm with a central area of cavitation. Because he is a Jehovah's Witness and didn't want surgery (surgery said they would take it out if the patient wanted it), a core needle CT guided bx was done. It showed "1. Reactive fibrosis with chronic inflammation 2. Negative for a neoplastic change." Micro was not sent (!) but no organisms seen under histo at least. This post was to show Lazar that some of my weird DDx do exist. Good pick-up by JJ and Doug. This young patient had ample opportunity to catch some unusual organisms in her trips. I obtained a CBC with diff (just very mild anemia with normal diff - 2.5% Eos) and a serum IgE (777 - that's high). I also requested 3 consecutive stool samples. The first was negative but in the following samples there were rare Strongyloides larvae seen on the trichrome. Strongyloides (and hookworms in general) will cause slow GI blood loss with anemia and their life cycle leads them through the lungs with wheezing. She has been started on albendazole and bronchodilators and already feels much better and has a follow-up within a few weeks. I will keep you posted. 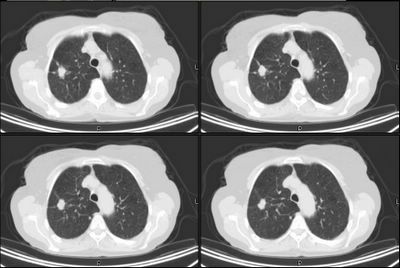 This is a 53 year old man whom I initially met when he was referred to me for dyspnea and cough which developed in the setting of recently completing adjuvant radiation therapy for lung cancer. 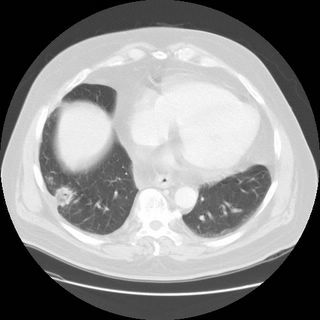 He initially had a left upper lobe nodule, 2.5 cm in diameter, discovered on a "routine" physical exam with a CXR. 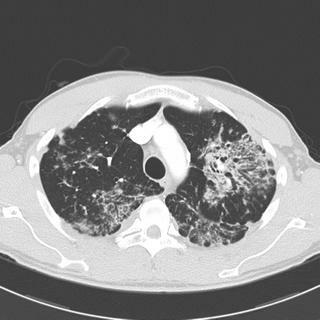 A CT showed no lymphadenopathy, and he had normal PFTs. 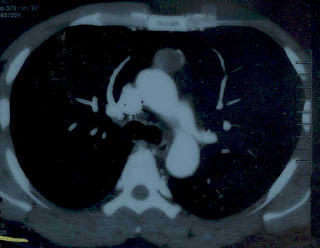 He had a CT guided biopsy showing a carcinoma. He was referred for lobectomy, which was done in March 2000. 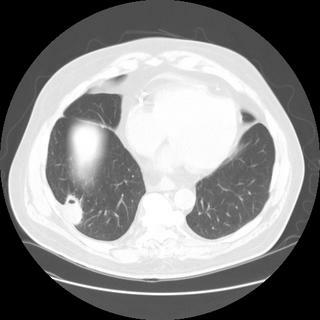 At the time of surgery, all of his lymph nodes were negative, but the surgeon noted a tiny fibrinous adhesion between the lung and chest wall, corresponding to the track taken by the biopsy needle. This was sent to pathology and was positive for carcinoma cells. 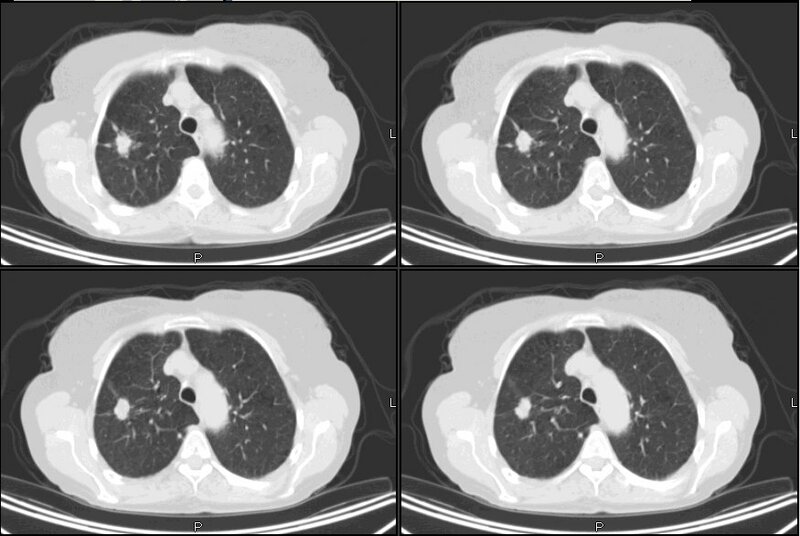 Feel free to comment on the case so far, as far as what you would do for him now (recognizing that in 2000, the thought of adjuvant therapy for lung cancer was not on anyone's radar), and whether you would have done a biopsy. I'll pull a Paul Harvey and come back with the rest of the story later. Just a reminder that in addition to the asthma post and the PET/obstruction posts below, the hemoptysis post is still active and there is a new comment so please check it out. Also, again, anyone who has not filled out the Survey please take 3 minutes to fill it out. Thanks. This is a 20 y/o woman seen last week. She is previously healthy with no label of lung disease. For the past 3-4 weeks she has had a dry cough with occasional expiratory wheezing and episodic dyspnea on exertion. No fevers/chills/NS/sputum production. She has also recently been diagnosed with mild iron-def. anemia and has been started on iron. Meds: prn albuterol (seems to help), PPI and Iron sulfate. Up to date on immunizations including typhoid, hep A and hep B.
SHx: No TOB/ETOH/IVDA. College student. Last year she spent 6 weeks in Peru in the poor outskirts of Lima as a missionary. She had a brief episode (2 days) of diarrhea and no other problems. She returned a month ago from 6 weeks as a missionary in Hong Kong. ROS: only respiratory complaints noted above. On exam, WN/WD, in NAD. VS normal. HEENT WNL. Chest with occasional rare expiratory wheezing but overall good aeration. Normal heart, abdomen, extremities. No rash. Spiro revealed normal FVC with FEV1~75%. Normal TLC and DLCO with increase RV/TLC. What would you do with the following patient: she's a 60 year old lifelong nonsmoker with quite minimal respiratory symptoms who was referred for nodule picked up accidentally during a hospitalization for small bowel obstruction (due to adhesions from a prior surgery). The interesting thing is that her PFT's showed significant obstruction (FEV1/FVC 59.1 (76%) FVC 1.47 (56)%, FEV1 0.87 (43%) TLC 75% ERV 114% RV 98% RV/TLC 135% predicted. 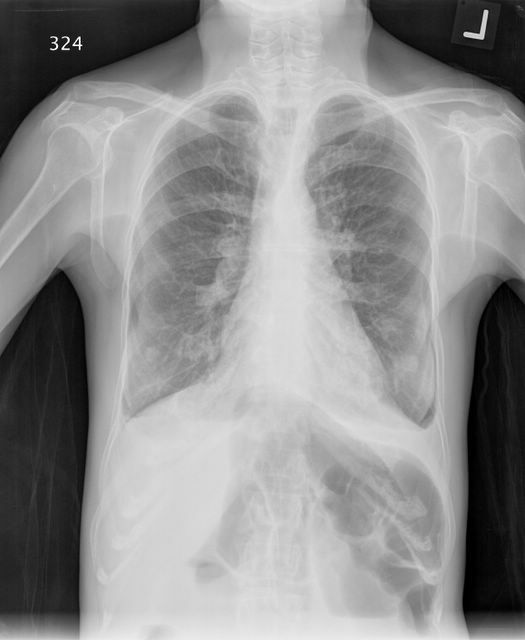 DLCO 76% DL/VA 130%; her height is 147 cm and weight 41.4 kg) and even her CXR looks like emphysema. Remember also that her symptoms are minimal. So what do you make of this? but the PET was negative and there has been no change in size compared to a CT done 6 mos earlier. 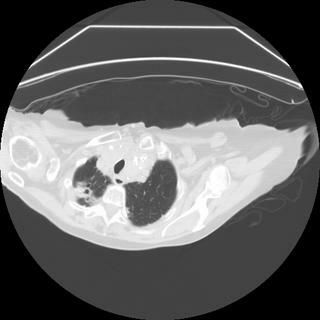 What would you make of the PET-negative lesion and what would you do about it? (i.e. take it out in a nonsmoker in case it's BAC) or follow it. One day on rounds the resident was presenting events overnight on a young patient who was previously healthy and was here for severe sepsis from cellulitis. After about a week on the vent, a sputum grew B. cepacia. I thought that was odd in a patient with no lung disease. A high res was even ordered and there was no bronchiectasis. Could never figure it out. As the weeks went by a few more cases here and there popped up. Infection-control was called in to investigate and they could not identify a source. We have very very few patients with cystic fibrosis in our hospital anyway. Finally, with the help of an FDA new release, the culprit was identified and the product is now recalled. Wyeth has a new IV ABTx around, Tigecycline - a glycylcycline with a broad spectrum of coverage and an indication for abdominal sepsis. Has anybody had any (good or bad) experience with it? 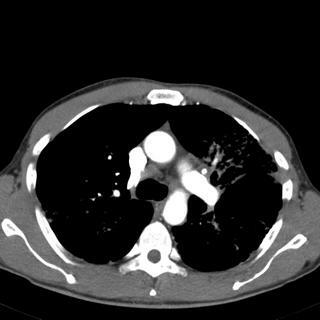 51 yo female with ESRD secondary to HTN, and multiple aortic grafts for both ascending and descending thoracic aortic dissection (initially repaired in February, revised in April and July) presented for dislodging subacute febrile illness. While working it up with several cultures and removal of a previously placed PICC line, she had some episodes of transient hypotension. 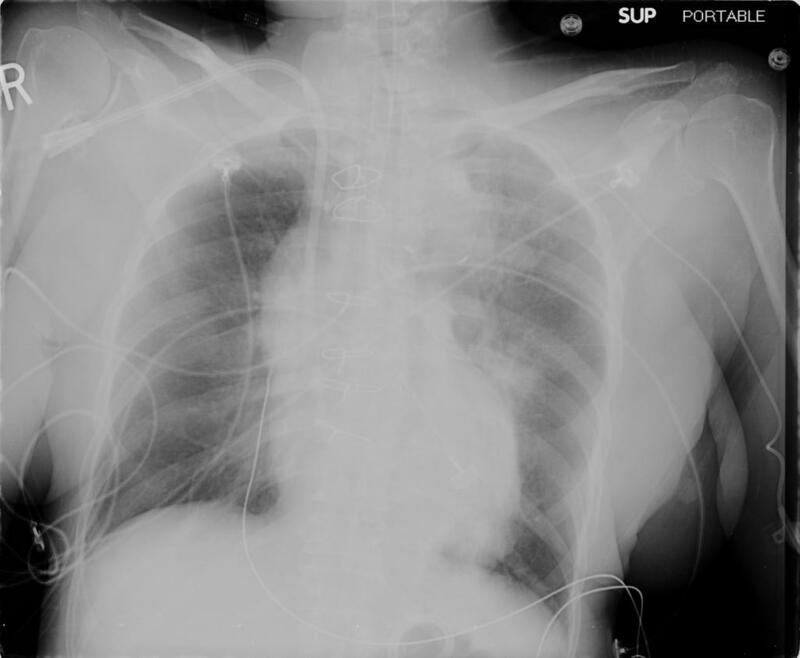 These were treated with intermittent fluid boluses and resolution of her hypotension. About 2 days into her hospital course, she was undergoing a regular hemodialysis run, when she had a cardiac arrest. She was in PEA, and was resussitated with epinephrine x 1 and IVF x 500 cc. She was intubated and brought to the MICU. Upon arrival, she was noted to have an episode of massive hemoptysis (~200 cc). A post intubation film showed the tube in a good position (see film). The episode was limited without intervention. A second episode occurred (~300 more cc) just prior to the bronchoscopic examination. PAST MEDICAL HISTORY: Ascending / Descending aortic aneurysm status post repair (unclear what was used as the old records had not been faxed prior to her decompensations), endstage renal disease, for which she is on hemodialysis, recent cerebrovascular accident with resulting encephalopathy, right groin ulcer, hypertension, history of cocaine use, hepatitis-A, hepatitis-B, hepatitis-C, enterococcal bacteremia and recent jejunostomy dislodgement. Hypotensive on Norepinephrine (20 mcg) with SBP ~90; sinus tachycardia 136; Saturations unobtainable b/c of cold extremities (ABG during code with PO2 of 200). and thought to potentially be malignancy. Here is a CT. 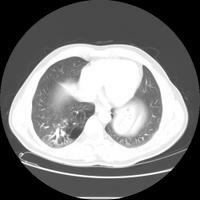 It was not thought to be cavitary based on radiologists interpretation. This is one of my chronic cough patients. She is 55 years old, remote smoker (quit in 1978) with a previous low-stage breast Ca (>5 years ago) and had initially come in with a chronic cough. I did a flex laryngoscopy and she had what appeared to be reflux laringits and her Hx was also suggestive of post-nasal drip. 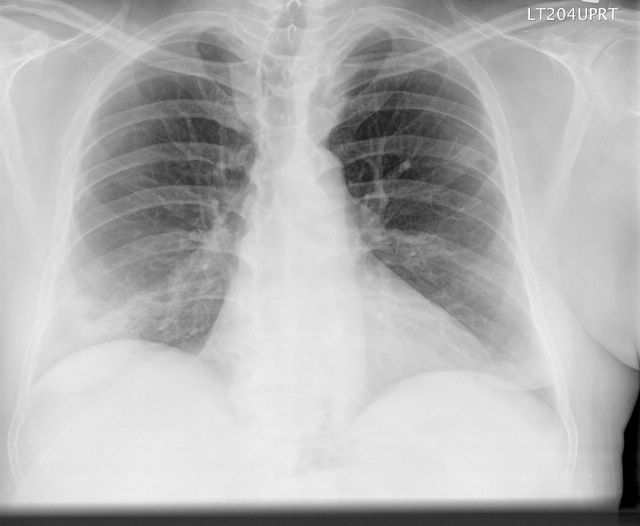 CxR was clear. Very mild obstruction on spiro. She was started on IN steroids and a PPI and did remarkably well with complete resolution of her cough. She remained symptom-free for several months. Unfortunately there were some changes to her insurance copays and she ran out of her meds and her cough came back. However, when we got her back on IN steroids, anti-histamines and PPI her cough persisted. Ct of sinus was unremarkable. CxR remains normal. We performed a bronch and her reflux laringitis was resolved. Her vocal cords were normal and she had some subtle changes of chronic bronchitis/chronic cough and her RLL bronchus was more inflammed than the other bronchi so I took some endoBBx and TBBx (looking for inflammatory/infectious conditions). Her Bx came back as Squamous cell Ca locally invasive (the path did not look like adenoCa). I was a bit surprised and since she had no mass I could see we did a PET-CT for localization and staging and that was negative for any masses or increased FDG uptake. This is a continuation from yesterday's case; it's probably too cumbersome to keep adding to the original post. The patient received solumedrol (later to prednisone 60) and lasix at the same time; I believe it was 80 mg IV but I am not sure how much per day. She improved and was 95% on RA. Because the BAL suggested lack of blood-dilution with subsequent lavages, the lasix was d/c'd and she was sent home on prednisone with a presumed diagnosis of diffuse alveolar hemorrhage, perhaps secondary to the high titer of anticardiolipan antibady. Here is her discharge CXR. As a reminder, this is her admission cxr. Her chest CT's shown in the original post are 2 months apart. An echocardiogram showed EF 50%, moderate mitral regurg. No vegetations. This was read as lots of hemosideran-laden macrophages but no evidence of capillaritis or vasculitis. A swan was placed based on the echo. It showed big V waves consistent with severe mitral valve regurgitation. The previous echos underestimated the degree of severity, apparently. She had her mitral valve replaced and all of her symptoms essentially resolved. The steroids and lasix were stopped and she continues to remain asymptomatic. 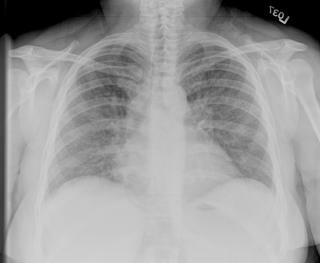 Her latest CXR is shown here. is from mitral regurgitation. Bloody aveloar filling can be from capillaritis as suggested by her high anti-cardiolipan titer, but the biopsy showed hemosid-laden macs which just means that macs were eating blood not that there was any vasculitis. Replacement of the valve solved the problem. My little lesson for the day: the whole autoimmune angle was a red herring. It was not active. The only positive results we have are a high titier and a sed rate of 100. The U/A was negative. The other titers were negative, etc. 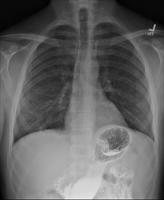 Before the valve was replaced, she was likely respondign to the diuresis, not the steroids. Here is an update from Arenberg on the case with hypoxia and presumed thymoma: The anti-aCh receptor antibody on thie gentleman is positive (5.7 with a normal of <0.02). *. A persistent non-puritic rash in her thighs and her forearms over the same period of time. *. Hemoptysis 2 months after the onset of DOE -– clots of blood about 1-2 teaspoons each day, then just pinkish sputum in the morning. *. Generalized joint aches in knees, ankles, elbows, and wrist. The small joints of the hand and foot are not involved. She gives history of increased stiffness of her joints in the late afternoon. Also she has noticed increased pigmentation of her cheeks, which has been diagnosed as rosacea few months ago. She has had borderline elevated blood pressure at one of her visits at her primary care physician office. She was referred to pulmonary clinic for this SOB. Her meds were some inhalers (she was told by her physician that her dyspnea was related to emphysema) and robitussin. On SH, she was a smoker (PPD x 23 yrs). Occup hx non-contributory. On exam that day, she was in no distress but SOB with speaking in full sentences. Her weight was 126 kg. Her BMI was 42. Her SBP was 120’s. EKG sinus tach with LAE. WBC 16 with 90% neutrophils. Hct 27. Sed rate 100. ANA negative. CK 83; c-react protein 5.7 (<5). ANCA < 20. RF negative. Chem.-7 unremark; (bicarb 23, creat 1.0). AST 60 ALT 38 albumin 4.0. HIV negative. BNP 574. Troponins elevated. D-Dimer 2000. Cardiolipin antibody: high positive IgG cardiolipin and low positive IgM cardiolipin antibody. of eosinophils. In rare areas there is basophilic degeneration of collagen bundles with surrounding neutrophilic debris containing erythrocyte thrombi. Direct immunofluorescence study was negative. Hepatitis C was negative. Complements C3 and C4 were normal. The U/A was normal without casts or protein. 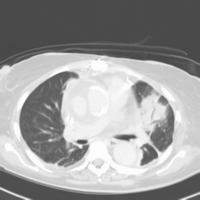 In terms of your thoughts on it being a vasculitis with pulmonary hemorrage, a bronch was done. Serial BAL was indeed bloody, but although the bronchoscopist felt that the bloody color did NOT change after 3 serial lavages, a hematocrit on these lavages was not done to confirm this impression. Nonetheless, the micro from the BAL was negative. The cell count was about 2850 WBC's, with 78% lymphs on lavage 1 and 80% neutrophils on lavage 2! Here is a CT before and after treatment with BOTH lasix and steroids. What is your ddx now, and what other tests would you like to help confirm? Note: this case has a follow-up. Please read that post after checking out the comments here. This is the patient with the large effusion and MRSA in the BAL. We eventually D/C'ed her home on PO clinda and she followed up in the office. She was feeling better: less dyspnea, no F/C/NS or weight loss. A CxR revealed still a small residual effusion. Her BAL Cxs then grew MTb. She was started on 4-drug Tx and feels even better (she never felt that bad anyway) and the effusion is all gone. I would ask that if your are reading this, please fill out this very quick and anonymous survey so we can better understand our visitors. 51 yo male previously healthy presented to his PCP with a 4 month history of losing weight. He is unclear how much, but has shortened his belt by 2-3 notches over that time period. He also has very little desire to eat as food does not taste as good as it has in the past. Otherwise, asymptomatic (specifically from a cardiopulmonary perspective). His PCP initially ordered an abd u/s which was normal. He was placed on 2 different antidepressants with no relief. A referral to a gastroenterologist is pending. A CT of the abdomen was performed. 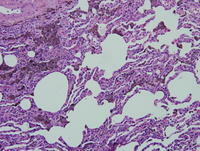 It was normal except some abnormalities seen at the bases of the lung. This prompted a CT chest. Representative cuts are below. He was referred to me for this. SH: Never smoker, drinks rarely. Police sergeant in a major city. No drugs (confirmed by 7 years worth of random drug tests that his PCP sent to me from his police precinct). He denies any drugs other than marijuana prior to 7 years ago). 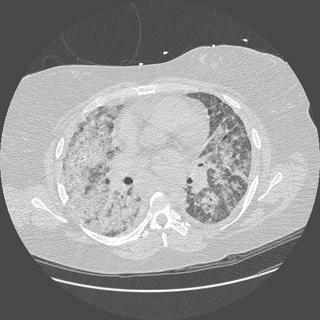 This 53 year old executive for a large multinational was referred for a second opinion regarding some asthma and hypoxemia. He had been very healthy until abouit 9 months ago when a routine physical exam resulted in a hemoglobin level of 18 g/dl, and was also abnormal when repeated. He was sent to see a hematologist, but did not follow up until more recently as he had been feeling well. He travelled to Brazil (his country of origin, this is for Carlos, he wanted to get some decent Feijoada...that and his Mom died of COPD...feel free to edit this part out). While there he developed a dry cough that persisted upon return, and eventually was treated with several courses of outpatient antibiotics, and steroids. He was referred to see a pulmonologist, who noted his O2% sat was low (~90-92), and referred him to the hospital, wehere a blood gas revealed a PO2 of 60 and a sat of ~85%. He had an extensive workup including a PE protocol CT which revealed no clot, a high resolution CT of the chest with normal lungs (no ILD, no nodules, no emphysemetous lung). The only abnormality was on the images included (see jpeg). He was also noted to have a hemoglobin of 18.5, but normal WBC count & differential. Electrolytes, usine, and muscle enzymes were normal (although his CK was in the upper reach of the normal range) He was treated with steroids and eventually discharged without a diagnosis, but was told to see us, and that he would need some follow up for the incidental abnorrmality on his CT. He had an echocardiogram which revealed normal LV function, no shunt, and minimal tricuspid regurgitation with "mild pulmonary hypertension" but no estimetd RVSP was reported. On review of systems he specifically mentioned a fatigue, and some weakness in his legs, as well as a frequent sensation of "choking" on saliva or food, nut no frank aspiration. He had just had a sleep study the week before he came down to Ann Arbor, and was told it was positive. He does have symtoms of poor quality sleep, but no PND, orthopnes, fevers, chills, or abdominal complaints. He has lost about 10 pounds in the last 6 months. Since discharge from the hospital he has felt slightly improved, but he was briefly re-hospitalized for three days with atrial fibrillation, which spontaneously converted after rate control. His spirometry was completely normal when I saw him, and his O2 sat was 97% on room air. The image included is a representative cut showing the abnormality. What is the differential for this finding, and how (if at all) would you connect this with his fatigue hypoxemia, and his elevated hemoglobin? What test(s) would you order next? I have no clue, but I know what I did. This is a work in progress, so as I get his results back I'll send them along. Very interesting comments. We all had similar concerns with the high LDH and high cellularity of the fluid. Here is some more data. She felt much better after the first thoracentesis and had good lung re-expansion. Here is a CT from that point in time. Her cough was dry so we could not get any sputum samples. I was also concerned about lymphoma. However, since her lung was not trapped, I did a bronchoscopy first rather than a VATS. Especially because that more anterior infiltrate seems like a real infiltrate and not just compressive atelectasis. Her TBBx showed non-specific inflammation and no malignancy. Cytology was not helpful. Smears were negative for AFB and fungi but + for GPCs and Cxs came back + for MRSA (kind of a "community-acquired" MRSA: RR to beta-lactams but SS to everything else). She felt much better and wanted to go home. Final answer above on Finalizing pleural effusion. 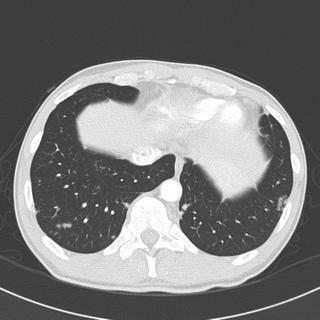 49 y/o woman, previously healthy, referred from a thoracic surgeon. Her primary complaint, for months, has been RUQ abdominal pain; during the work-up of this, she had a chest CT showing a RLL mass. Further evaluation of this by MRI showed that the mass was c/w a pericardial fat pad. In addition, she has complained of intermittant dry cough and chest pressure for several months. It is worse with exertion or when she "leans forward" but she has not noticed any diferences based on the weather, time of day, food intake, or around perfumes or pets. No fevers/chills/sweats. No sinus congestion or post nasal drip. No nocturnal symptoms. As a teacher, she notes worsening when speaking. She saw a cardiologist for these symptoms, and was prescribed a PPI which she never took. Spirometry showed a mild obstruction (FEV1 78%), with variablilty in the flow-volume loops but consistent early-flattening/plateau of the expiratory loop. The inspiratory loop was normal. My primary DDx was cough-variant asthma, GERD, or laryngeal dyskinesis, but the flow-volume loop was concerning. 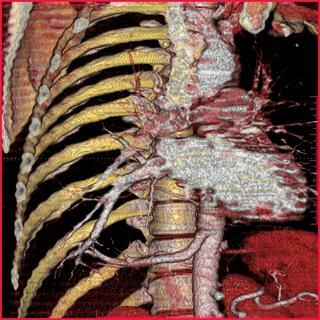 An airway-protocol CT of the trachea and mainstem bronchi with 3-D reconstruction did not show any abnormalities. A bronch was ordered for an airway exam. The airways were normal; for some reason, a BAL was obtained. This BAL is now growing MAC. In follow-up, her cough has improved with Advair, as has her chest pressure. She still complains of the abdominal pain/pressure, described as "something pushing up into my lungs." She insists that it is the pericardial fat pad, and that it should be removed. So far, GI w/u is negative. 1) Is the MAC real, or a contaminant? 2) She has no sputum production: would you repeat a bronch with BAL to obtain a second sample? 3) Might her MAC be related to her symptoms? This is a 65 y/o previously healthy woman. No TOB, no chronic lung disease, no cardiac disease. She was transferred from an OSH with 2 weeks of low-grade fevers and now has a dry cough, orthopnea, worsening DOE and L pleuritic CP. No hemoptysis or purulent sputum production. Unremarkable PMHx, SHx and FHx. ROS + for chills and fevers, no night sweats. Resp as per HPI. No GI/GU complaints. Her exam was mostly normal except for decreased BS, dullness to percussion and egophony on the L base. Her inital WBC count was 5K with aleft shift. 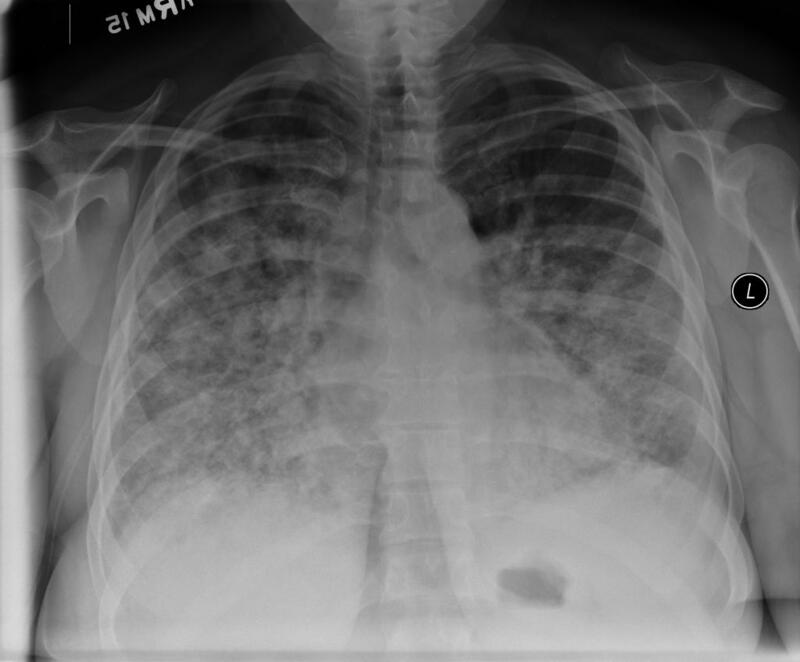 Unfortunatelly her first CxR was an outside film so I can't post it: it showed a large L effusion (3/4s up). 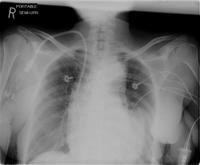 A thoracentesis was performed and post-tap CxR is as follows. Her pleural fluid revealed: 24,440 WBCs (all Monos), LDH 1755 and glucose 65 with no organsims seen. What would you do next and what is your DDx? Follow-up above on Follow-up to Pleural Effusion. I thought this was an interesting case. It is actually a case of pulmonary sequestration. You probably know that there is intralobar and an extralobar sequestration. The former occurs within the visceral pleura of normal lung tissue. It doesn't communicate with the tracheobronchial tree. 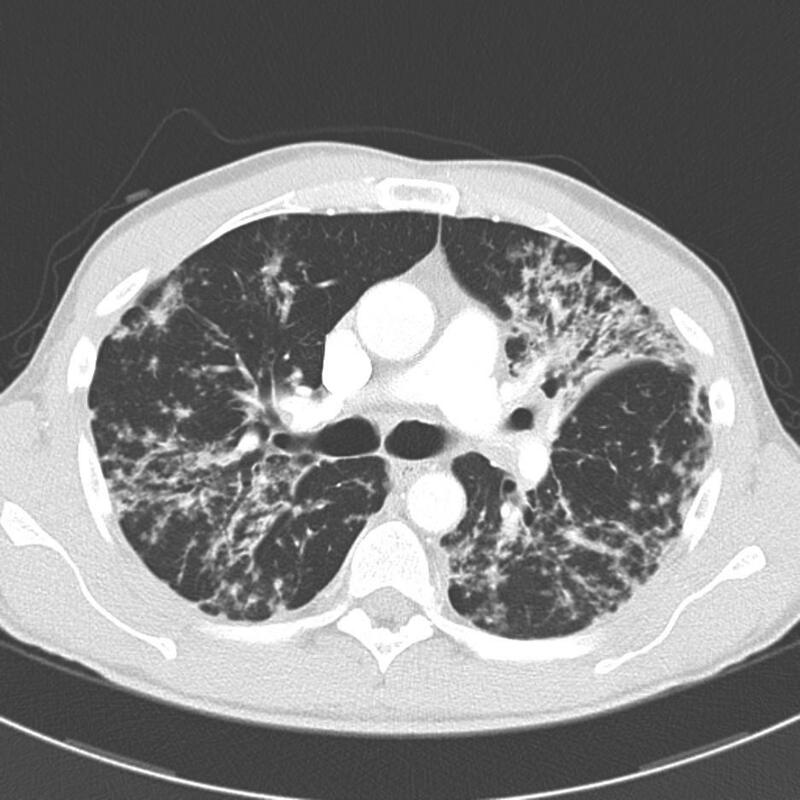 It looks cystic on CT. 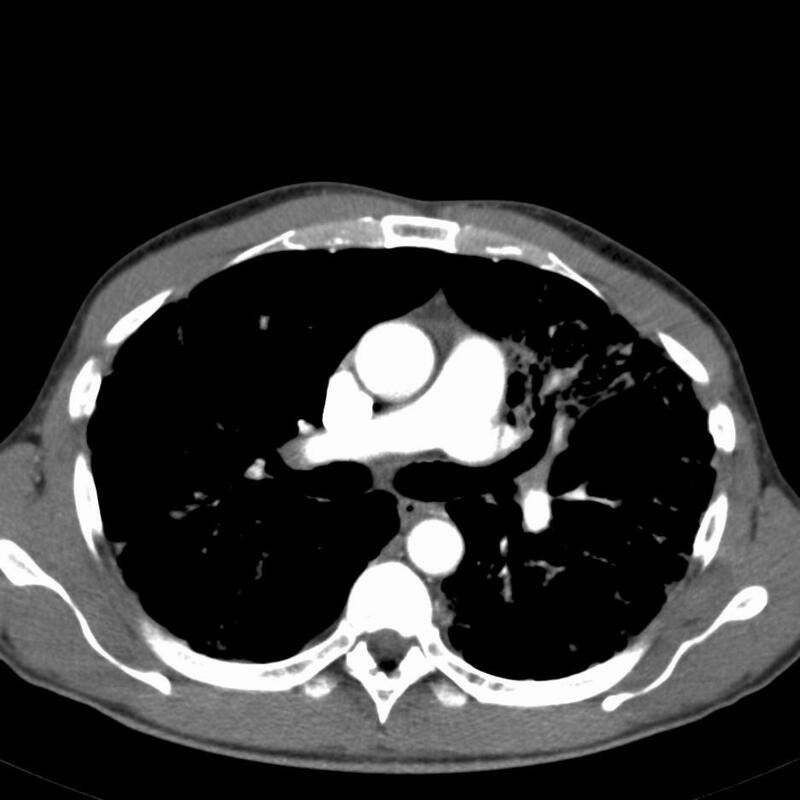 The CT shows the cystic-appearing area involving a region of the posterior basilar segment, right lower lobe. In other slices not shown, it was about 8 x 4 cm. If you saw the whole CT and/or looked at the CT reconstruction, you would note that there is an abnormal systemic artery extending from the lateral aspect of the aorta into this portion of the lung. Venous drainage is to the left atrium. We had had this discussion on the PI for the new mometasone autohaler (Asmanex) and the expiration period of 45 days for the inhaler. We contacted our Schering rep and they have had tis question from many practitioners: it seems that it is a stable molecule, it will last more than the 45 days and we can prescribe the 60-dose inhaler to save patients some money (they are both priced the same). The explanation is that they only studied the use of each inhaler up to 45 days so they had to add that disclaimer to the PI. 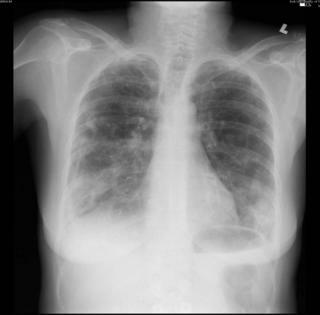 What is the abnormality and what's your differential. Dont worry about guessing way off base, just guess! The BAL fungal culture ended up growing out nocardia asteroides. Based on the preliminary report from the micro lab I obtained a head CT to exclude CNS involvement, which was negative. I started her on high dose bactrim which ended up being 1 DS tab qid and followed CBC,chem 7, LFT's to monitor for toxicity. After 8 weeks of high dose bactrim her symptoms significantly improved and the basilar opacities on her CXR have improved. I lowered her bactrim dosage by 50% to 1 DS tab bid which I plan to continue for at least another 6 months. She still has diffuse interstitial opacities on her CXR, so it's likely that she does have underlying ILD and the nocardia was a complication of her steroid therapy. One radiologist felt that all the changes could be due to a chronic nocardia infection, but I would have expected more systemic symptoms and involvement if that were the case. I posted her followup CXR below. This is a 58 y/o Scottish woman with dyspnea on exertion. This had been progressive initially but is now unchanged. No chest pain, no F/C/NS/cough/hemoptysis. ROS only positive for DOE and occasional rare dry cough. Exam: overweight woman in NAD. Weight: 163 lb with height: 62 in (BMI:29.8). Normal HEENT, clear lungs, S1/S2 RRR, benign abdomen. Spiro: FVC 106% and FEV1 103%, TLC 102% (no air trapping) and normal DLCO. Methacholine challenge showed some reduction in FVC and FEV1 at 25mg but not reaching significance. Here are the highlights of her CPET. What do you think? 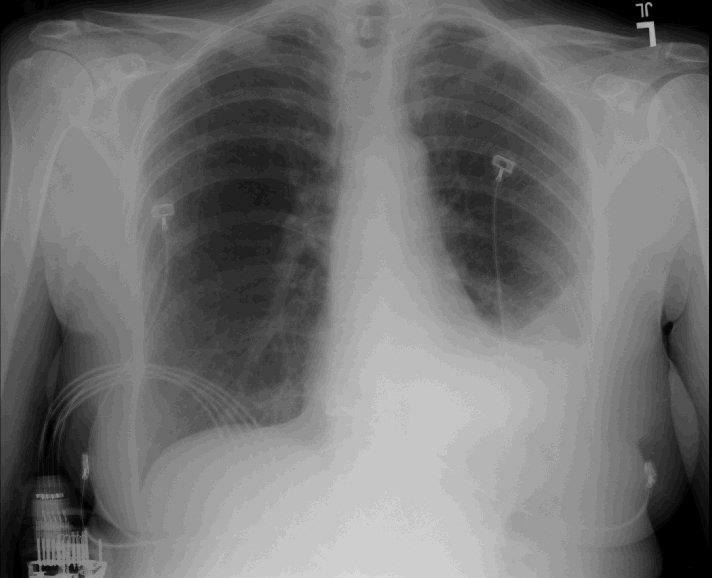 Pt stopped due to dyspnea. VO2 max: 1.025 (57%) with VO2/kg/min of 13.8 (52%). AT: 0.692 (predicted >.715, 39% of VO2max). HR: 137 (85%) with O2 pulse 7.5 (89%) and HR reserve 24 (<15). VEmax: 47.8 (72%) and Vt at peak: 1.128L (169%), RR: 40 (<50) with breathing reserve 9%. Vd/Vt: o.50 at rest and 0.29 at peak (0.30 and 0.18). RQ at peak was 0.94 (1.1-1.3). 47 y/o airline pilot who frequently flies internationally to Mexico, Central, and South America who presented to his PCP with 2-3 months of progressive focal low back pain. An MRI was ordered and he was referred to neurosurgery. The MRI showed L3-L4 disk herniation and "significant inflammation concerning for infection." He was seen in the outpatient neurosurgery clinic for his back pain, and surgery was scheduled for “pain relief.” At the time of that visit, he had noted the new onset of fever to 102, chills, and sweats. His surgery was scheduled for 1 week later. “Ill-defined right upper lobe, anterior segment, airspace opacity with adjacent fibrosis and likely ipsilateral hilar and mediastinal lymph node enlargement. 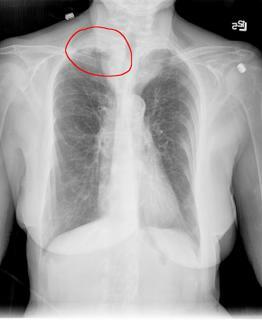 There is an adjacent area of pleural thickening at the right apex”. Thoughts/next steps? I will give some more information after a brief period for comments, and some imaging will come in a follow-up post. 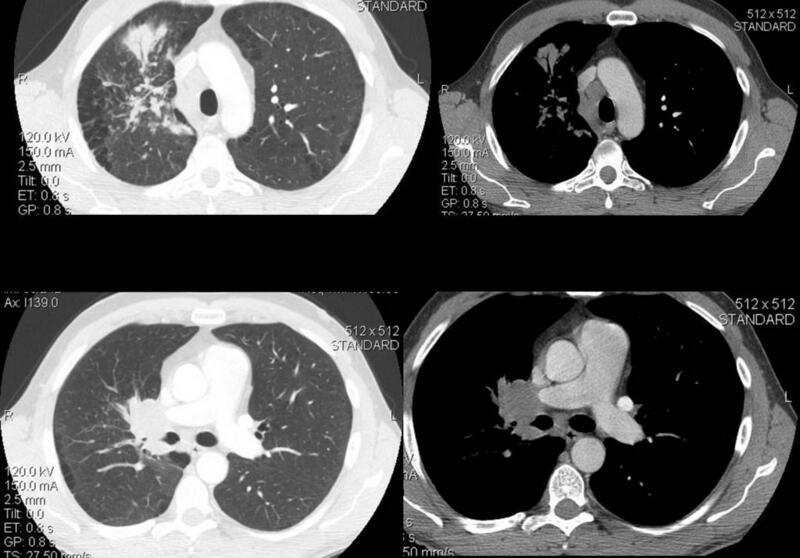 This is a follow-up on the post below: this is the 60 y/o woman with dramatic smoking history and enlarging RUL mass. We must have all trained in the same place or read the same data... I had the same exact thoughts as you have outlined. She was seen by our CT surgeons and the mass was ressected. The frozen suggested benign inflammatory tissue. The path was caseating granulomata and the micro on the explant was smear+ for AFBs. Smears of the airways and other respiratory secretions were negative. It looks like this is a tuberculoma but there still seem to be viable AFB within it. She has already completed a previous course of Tx for TB. What would you do now? This is a 60 y/o woman with a 50-pack-year Hx of smoking who presented with a RUL mass. Her History is remarkable for +TB in 2003: she had a clear exposure with a small RUL infiltrate and +AFB. Her isolate was quite pan-SS and she received standard Tx (initially INH/RIF/ETH/PZA) with DOT. She was smear-negative at the end. She is now assymptomatic but has a suspicious enlarging RUL mass. No other relevant history. 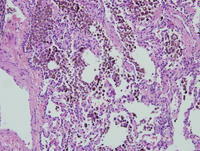 Bronch was AFB-smear negative and non-diagnostic. PET scan showed increased activity (SUV~2.5) in the mass only. Answers and further discussion on the post above. Excellent comments/suggestions (see original case here). This patient had an office job and is now retired. No history of exposures relevent to hypersensitivity pneumonitis or occupational lung disease, no asbestos in particular. There is a family history of asthma. 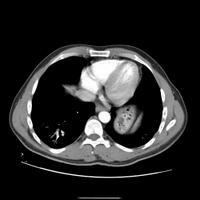 She had a cardiac w/u prior to her referral which was normal, including a surface echo. Her chem 10, CBC, ANA, ANCA, IgE, were (-). Her ESR was mildly elevated. Her films from 2000 were requested but never received. 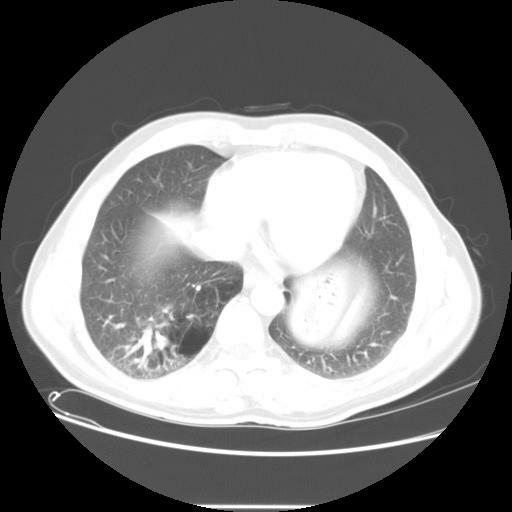 Unfortunately I do not have any digital images from the CT to share, but the degree of pleural reaction/thickening at the lung bases was significant, and is seen much better on the CT. 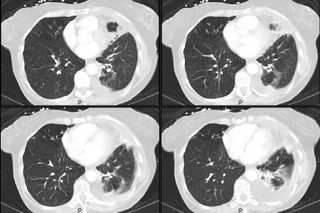 There weren't any calcified plaques, enlarged pulmonary vessels, or significant emphysema. I reviewed her films with radiology (BG) who agreed that the pattern of infiltrate/scarring did not point to any particular IIP, and thought the adjacent pleural reaction was highly atypical for an IIP. 2 weeks later the fungal cultures returned positive for a branching gram positive rod. Mrs S. is a 72-year-old female with a history of asthma,mitral valve prolapse, and positive PPD (treated with INH), and diabetes. She has a history of longstanding asthma which has been well controlled with long-acting bronchodilators and inhaled corticosteroids. 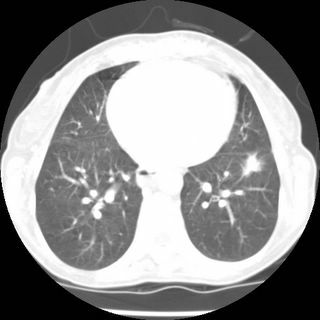 In 2000, she was found to have interstitial infiltrates on CXR and CT and was seen by a pulmonologist, who thought the abnormalities were either due to old granulomatous disease or possibly an idiopathic interstitial pneumonia. Pulmonary function studies at that time (June 2000): FEV1 1.48 (59%),FEC 2.15 (69%), TLC 4.98 (95%), and DLCO 19.1 (95%). She was also found to have a significant bronchodilator response with 12% improvement in her FEV1. In January 2005, she developed worsening symptoms of chronic cough and dyspnea. She was hospitalized 3 times over the next 6 months for “pneumonia” and treated with several courses of antibiotics, steroids and a 1 month prednisone taper without significant improvement. 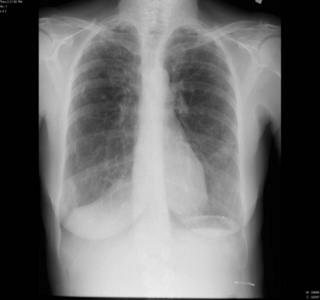 She was referred for evaluation of recurrent pneumonias. At her visit in 6/05 she reported a persistent dry cough and DOE walking 100 feet. She denies any rheumatologic Sx, purulent sputum, exposures. She had been off oral steroids for 4-5 weeks. She has also lost 15 pounds since January 05. Meds: Cardizem, Lipitor, aspirin, Singulair, Flovent 2 puffs b.i.d., Serevent 1 puff b.i.d., Fosamax, and Allegra. Social history: married and lives in the metro area. She is lifelong nonsmoker. Denies any significant use ofalcohol. She denies any pulmonary exposures or travel outside the United States. Outside PE-CT scan (3/05): No evidence of pulmonary thromboembolic disease. 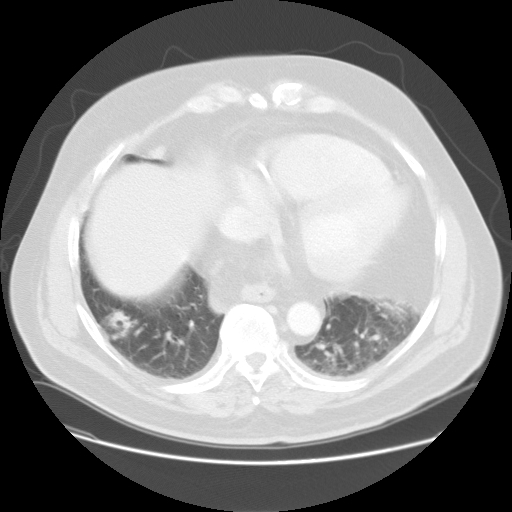 There was diffuse, but basilar predominant, interstitial and airspace disease with associated pleural thickening and mild bronchiectasis. 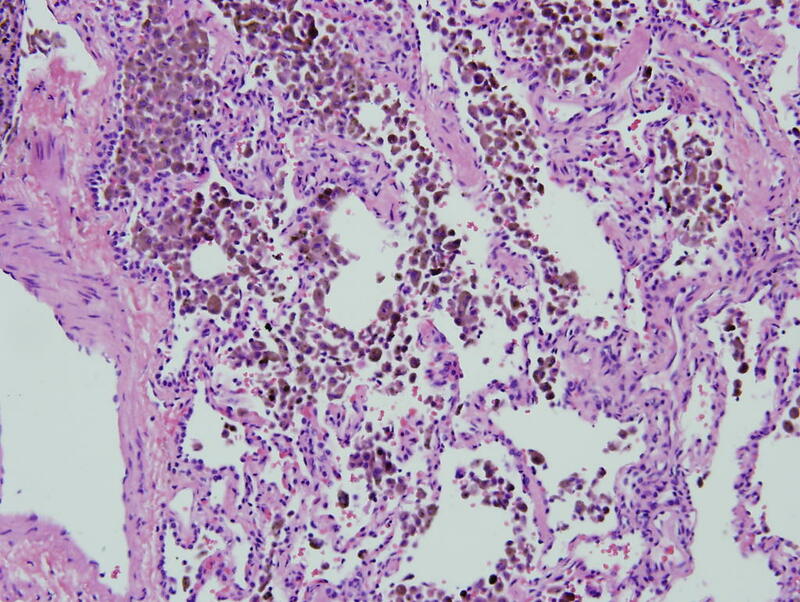 Bronch: Normal airways, bacterial GS/culture (-), fungal/AFB smears (-) cultures pending, cell count 480 wbc (68%N 10%L 0%E) rbc 150Cyto: (-)TBBx Right lower lobe of lung: Fragments of alveolar parenchyma with mild interstitial fibrosis. No granulomas. No virocytes. No evidence of malignancy. Abnormal, non-diagnostic biopsy. What do you think she has and how would you proceed at this point?